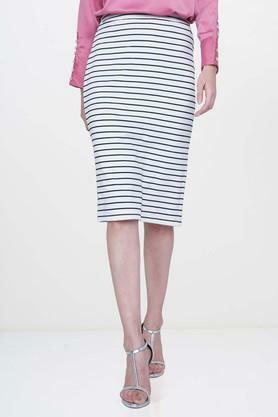 Look impressively beautiful by wearing this pencil skirt presented by AND. Tailored to perfection using a premium quality fabric, it will ensure you a hassle free maintenance. In addition, it comes with an elastic waistband with that will make it convenient to wear. Besides, it also comes in a stripe pattern that lends it a trendy look. Let your style do all the talking by wearing this pencil skirt will be a perfect choice for you to wear on any casual occasion. It will go well with a shirt and a pair of pump shoes.